My husband is a big fisherman and last year he decided we need a canoe so that he could fish the local ponds here and in his hometown which we often frequent in the summer. I scored a great deal on an old town canoe on craigslist for $150 and we haven’t looked back. This past week we were on vacation so we were in the canoe quite a bit (about 5 times on 5 different ponds) but yesterday was the most memorable. My children are ages 5 and 2 and I just got done being impressed by how well they’ve been doing both fishing and canoeing when we went out on our trip yesterday. Thus far, no one’s got a hook in the face or fallen out of the boat. I was really pleasantly surprised. It was much more than I was expecting as far as progress. The pond we went to is about a 35 minute ride from our house and I long ago stopped packing extra clothes and things for our little excursions. Today was different. We arrived at about 9 am and we were one of the first people at the pond. It was quiet, the water was still and the only action was coming from the goose family floating on the lake. It was about 70 and sunny and it was going to be a gorgeous day. We got in, started paddling out into the pond and my one son spotted some minnows on the side of the boat. The other was like “Oh, I wanna see” and went over there way too quickly. In one instant, we flipped. Thankfully we were only about 25 feet from the shore, so we got ourselves together, grabbed the boat and swam back to shore. Despite having multiple sunglasses and things that didn’t float, we didn’t lose a thing. My son instinctively grabbed my hat and swam with it. The kids did not panic or cry but we were soaked to the bone with no change of clothes. I stripped my little one down to his diaper and life jacket and that worked just fine. My older one had thin nylon pants that didn’t take long to dry. I, on the other hand was sopping wet and stayed that way for the next 2 hours. Oh well. We got back in the boat, paddled out and started fishing. Within 5 minutes, my older son caught a pickerel. The pickerel has been eluding us all week, so this catch was already was worth the dunking we had just received. We paddled around and were catching little fish left and right. Next the kids caught bass, perch, sunfish, crappy, another pickerel. Life was good. The Mexicans start talking excitedly amongst themselves. They just witnessed the whole thing and I can tell from the tone it’s something like “they have our fish..should we say something?” We quickly yell over, “Hey is this your fish?” Relieved and happy, they yell back hands in the air “YES!!! !” We row over and hand them a nice sized large mouth bass. They are ecstatic and start taking pictures of the fish with their camera phone. I can only imagine how infuriating it must have been to lose such a big fish and then watch that bobber swimming underfoot for god knows how long with no way to get at it. Normally at ponds we are a catch and release kind of family but we made an exception in this case. Speaking from personal experience, immigrants fish for dinner, not for sport. The enjoyable part of fishing is just a side benefit of foraging. A very happy ending indeed. Our fellow fisherman friends did end up with the big one that almost got away and I’m sure they had a very delicious bass dinner that evening. Seeing them brought me down memory lane and it ended up being such a nice day for everyone at the pond. When we got home Babci asked if we caught anything. We said yes, but it was all little stuff. Then she got mad at us for not bringing home all the small fish so she could grind them up and make fish meatballs. I promised her more ocean fish but she still wasn’t satisfied. She said the small ones are the best because you can eat them whole, bones and all. Old habits die hard. We will have to bring a few lake fish home for babci sometime soon. I hope you all are enjoying your summer as well. 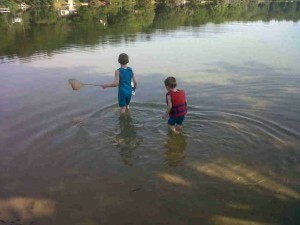 What a great time, fishing from a canoe with little dudes…. Little perch make great fertilizer for tomatoes and roses, buried in the soil near the root zone. You gotta throw the small fish back so they can become big fish for later! It sounds like you had a great time fishing. I haven’t been boating in a while, but I do love the calm of ponds and lakes. That’s awesome. I’ve never been a fisherman but I think it would be kind of cool. We’re going up north with my in-laws next month and my father-in-law asked if I wanted to go salmon fishing. Who knows if it’ll actually happen but that’d be kind of cool, so long as I take my dramamine (I get seasick pretty much anytime I’m on water). It sounds like you and family had a great time! We are not much of a fisherman, we are way too impatient. I like going kayaking though, it’s fun to see some nature. Hmmm- how did I not leave comments on this article before now. Babci got some bone free already filleted tautog this weekend from a fishing trip. She stopped complaining about not getting little fishies after that. Nicole – yes, you must leave the little fishies in so they procreate and make more fishies and grow up to be big fishies. Fishing is fun when you go with someone who knows what they’re doing. You actually catch stuff then.